Little did Kairma know, as she wished away her responsibilities, the old religious myths were true; around her neck hung the fate of the world. 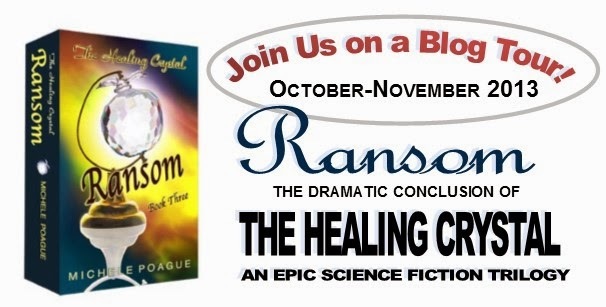 Ransom is the final book in the Healing Crystal Trilogy, a light science fiction story that follows young Kairma as she discovers the true nature of the Crystal she wear around her neck. Will she use it to save the world, if it can be saved, or will she return to her secluded village and let the world continue to suffer? JOIN US FOR A FUN LITTLE QUIZ! Michele Poague is celebrating the release of her final book of the Healing Crystal Trilogy with a big tour and a raffle with a crystal encrusted apple USB holder and a gift certificate as prizes. She has also dropped by with a little quiz for us! Take the quiz below and see how you rank. So what kind of reader are you? Take this fun little “Yes or No” quiz I came up with to find out. Answer ‘yes’ to all that apply. Give yourself one point for each ‘yes’ answer. a. I read at night to clear my thoughts. b. I read at night because I have time for reading. c. I read until morning, or until the book falls out of my hands. b. I read the newspaper or daily magazines. a. I’m still reading the same book I was reading at breakfast. b. I read the magazine left in a rack by the toilet. c. I read in the bathtub to escape. a. I never leave home without 2-3 books. b. I read maps, travel books, and road advertisements. a. I read until the book is done come rain or shine. b. Rainy weather makes me feel like curling up with a good book. c. I read because I don’t want to play tennis in the rain. a. I read because some of the cool pictures have words. b. I read news and postings from my friends. c. I read anything and everything until my laptop falls out of my hands. a. I read news or trade magazines. b. I read “How To” manuals. c. I read encyclopedias and dictionaries. a. I read in the waiting room at the dentist or doctor’s office. b. I read school or work assignments. of all kinds and likely subscribe to three or more magazines. your hands. You are likely to read several different genres. are probably your preferred escape. The Anti Reader: Quite surprised you found this quiz! ENTER THE RAFFLE FOR YOUR CHANCE TO WIN! VISIT OTHER STOPS FOR MORE CHANCES TO WIN! 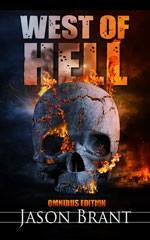 Posted on November 1, 2013, in Promotions and tagged ebook, giveaway, Healing Crystals Trilogy, Michele Poague, rafflecopter, Ransom, SCIENCE FICTION. Bookmark the permalink. Leave a comment.